CB Dutch Treat is a feminized medical marijuana strain with the highest CBD – THC ratio available through us. A potent medicinal strain, comprising of largely Sativa dominant genetics, made from Azura and Amnesia Haze. A great choice for both indoor and outdoor planting, perfect for beginners and more seasoned growers alike. If you’re looking for an easy-growing, heavy yielding plant, this medical marijuana strain has it all. While medical technology has advanced considerably over the years, it is also beginning to show us the medicinal benefits of some of the compounds found in marijuana. A chemical called CBD has been shown to have a wide number of applications, ranging from reducing epilepsy, to assisting sleep and increasing the appetite. Medical marijuana strains differ from recreational strains in their chemical composition. While standard strains tend to focus on increased THC levels to increase the ‘high’. Medical strains reduce the THC and elevate the CBD levels, reducing the euphoric effects and enhancing the medicinal values. CB Dutch Treat has been created purely for medical marijuana users with a 2:1 ratio. THC is reduced to as little as 4%, while the CBD content is increased to 8%, making it the most powerful natural source available through us. Considered an easy strain to grow, CB Dutch Treat can be cultivated successfully either indoors or outside. 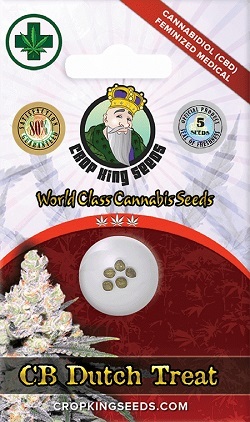 All the seeds are completely feminized, guaranteeing only female plants and removing the need for sexing. Grown outdoors the plants will flower naturally as the daylight hours reduce over the season. While indoor growers should reduce their lights to a 12/12 ratio to induce flowering, with the plants requiring between 9 – 10 weeks to achieve peak maturity. Yields are good, with the plants generating around 500 grams of spicy, pine-flavored buds per square meter when grown indoors, and similar ‘per-plant’ harvests when grown over an entire season outside. The plants can grow tall, easily achieving 1.5 meters, with indoor growers using techniques such as staking, topping and bending to control any height issues. CB Dutch Treat is the perfect choice for medical marijuana growers looking for a Sativa dominant strain. With its rich CBD content, and low THC level it maximizes its therapeutic values, while generating a modest, happy feeling and calm sensations. You can buy CB Dutch Treat in packs of 5, 10 and 25 feminized seeds, with secure payment facilities and delivery options. A great choice for the medical marijuana grower, both beginner and the more experienced. Buy CB Dutch Treat Medical Seeds today and receive fast discreet shipping to Canada and all US states.